Admiral Overseas Corporation (AOC) has continually lived by the "art of colors" in bringing beauty to our digital lifestyle by offering a wide range of top performing CRT & LCD monitors and LCD TVs. 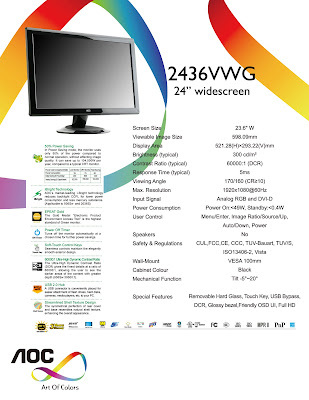 The new AOC 36 monitors series was launched on September 23, 2009 at Banana Leaf in Greenbelt 3 in Makati City. The new AOC monitors included in the AOC 23 Series are: 936Sw, 2236Vw and 2436Vw. But more than this advancement in technology, AOC has always considered their products to be environmental-friendly. AOC being a green company have set the standards of manufacturing products that do not need to sacrifice quality performance and great display for energy efficiency. This is what amazes me with this new product... AOC Monitors require low energy consumption; it offers premium picture quality for graphics-intensive applications. These competitively priced high performance monitors have unique external design, framing the screen in a glossy piano black finish with sea shell texture and seamless controls to maintain the elegantly smooth exterior design. When switched to Power Saving mode, the monitor only uses 50% of the power, this without affecting image quality and saving up to 104,000W per year. Up to 75% of the energy used in a typical LCD monitor can be saved while using the 936Sw compared to CRT monitors. A USB connector is also conveniently placed for easier attachment of devices. 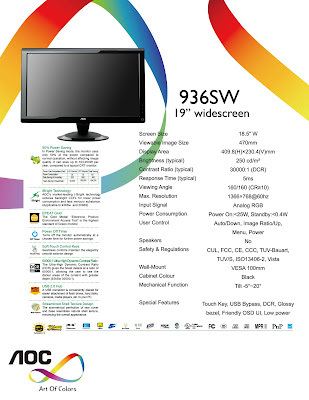 The 936Sw is a 19" LCD Monitor, with analog D-sub input. It requires low energy consumption making it ideal for those looking for technology that shares their commitment to sustainable technology. The 2236Vw is a 22" LCD Widescreen HD Monitor, with both analog D-sub and DVI-D inputs. It has a super-fast response time, its wall-mountable and requires low energy consumption. The 2436Vw is a 24" Class LCD Widescreen HD Monitor, with both analog D-sub and DVI-D inputs. It has a super-fast response time and it’s wall-mountable.